No carrot or red velvet cake is complete without a creamy layer of cream cheese frosting. The frosting is made by mixing firm cream cheese, powdered sugar and vanilla extract to make a sweet icing to complement almost any confection. 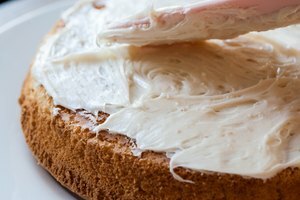 When cream cheese frosting is over-beaten, it becomes runny and will not adhere properly to your sticky buns or cupcakes. 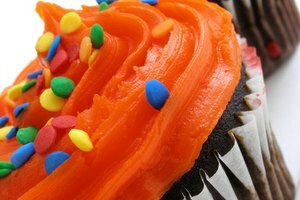 There are several solutions to restore the thick texture to your cream cheese frosting. Add 1/4 tbsp. powdered sugar to the mixture. Stir the cream cheese frosting and continue to add more powdered sugar until the desired consistency is achieved. Pour 1/4 tbsp. heavy cream to the mixture. Place the cream cheese frosting into the fridge for 30 minutes and stir. Add more heavy cream to the mixture until it is thicker. 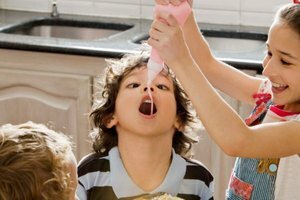 Avoid using too much heavy cream, as it will make the frosting taste too sweet. Cover the cream cheese frosting with plastic wrap and store inside the refrigerator for 30 minutes. Remove the frosting, stir it and place it back into the fridge for 30 minute increments until you achieve the consistency you’re after. Add 1/2 tbsp. vegetable shortening to the mixture. Stir it well and continue to add small amounts of the shortening. The shortening will thicken up the frosting without altering the flavor. Avoid over-beaten cream cheese frosting by mixing in any liquids in small amounts and by using cream cheese that is chilled and firm, not runny and room temperature.